In about 2003 or 2004 I came across a very low frequency crystal, in a B7G glass valve (tube). These really low crystals have resonance frequencies measured in kHz not MHz. Even below 10kHz. For whatever (unjustifiable) reason I wanted to make a low frequency crystal oscillator, with valves (tubes) not semiconductors. I made several attempts at this, coming back to it several times over the years, and always failed. Information is very scarce. Look around the internet, you cannot find anything about these ancient very low frequency crystals or their oscillator circuits. I did find (and people sent me) a few documents. Now I have finally succeeded at this project, this is the story. This is all I have left from the first attempt in 2004 (approximately, judging by the other things in the photo). There is some more information on this page. This crystal was an 8kHz unit. As is common to all of the very low frequency crystals I have seen, they are a long bar of quartz in a B7G glass envelope. The bar has a square cross-section and metal (gold?) plating in various patterns on each of the four long faces. There are 3 (or 4) connections to these kinds of crystals. The big question is, how do you arrange for a circuit to make these oscillate - when you are used to MHz frequency crystals, which have only 2 wires? CLICK HERE for a pdf document of a book extract (source unknown) which discusses design of very low frequency oscillators, including a lot of theory and some circuits. I also have another document, 2 pages (source unknown), CLICK here for the PDF. To the right, this is a circuit which I constructed to try to make that 8kHz oscillator work, and it did NOT work. Below, some very low resolution photographs of the crystal and the workbench. The crystal had an oven too! From 2004 to 2017 I made a couple more un-documented, and forgotten attempts - all unsuccessful. Some more low frequency crystals were obtained but none ever oscillated. Mine is serial number 343919. It has four wires, two of which are internally connected. So this is a 3-connection crystal, similar to what I had seen before. In the following gallery (click for larger images) the diagram shows the metal plate pattern, and the connections to the 4 wires on the base (B7G valve base layout). All the faces are gold-plating, the colours in my diagram are only for ease of identification. The "back" face is also connected to the "front" face via the small sections of side strip where the 5 and 3 wires are connected. Then at the start of 2017 I had email correspondence from James VK5ASE and we got onto the topic of these low frequency crystals. James sent me two documents. The first one was a GEC oscillator circuit. That looked very complex to me, and it seemed to me that the probability of getting that working must be several orders of magnitude less than the other circuits I had already tried (and failed). See below. The second document was some scans of a document about a 4 or 5kHz crystal oscillator unit called 2A-D7 which was used in multi-channel telephone systems. I enhanced the images and put them together in a PDF. You can CLICK HERE to read this PDF document. The crystal in this device has an oven, which is in itself a very interesting topic - but let's concentrate on the crystal part here. After some more months, I found time to build this circuit. I used the proper valve CV138 (EF91, quite common), and 150V regulated supply voltage. I used an old germanium diode for the AGC rectifier (MR1 in the diagram). A short digression, for some photographs of the power supply. This uses a transformer from Ask Jan First electronics in Germany https://www.die-wuestens.de/eindex.htm and a matching 10H choke. Jan has these custom-manufactured for him. The power transfomer has a 6.3V winding for powering lots of valve heaters (tube filaments), and a 5V winding for rectifiers. The rectifier valve (right, in the photos) is a GZ34 I think, but the numbers have long ago worn off. The valve on the left is a VR150/30 neon-filled gas regulator tube. This power supply is not really finished (the meter on the front is not connected), but it works well enough. Outputs are 6.3V AC, and 150V DC, and 260V DC (around 240V-260V depending on the load). The construction is a chassis made from double-sided PCB. Firstly, this is a 4kHz oscillator from a discussion in 2014 (I think), which I think was one of the occasions when the topic of LF oscillators came up again. As Ian K3IMW suggested, I set out to measure the series resistance of the crystal. The results certainly show the crystal is working well and I learned many things from this experiment. The signal generator is the audio output of my tablet computer. It measured a 1.2V peak-peak sinewave. The test signal was generated by the freeware audio program Audacity and the frequency can be set with very high precision. I created an audio track consisting of 30 continuous seconds of the specified frequency, which I "played" to the crystal. The output voltage when the crystal is bypassed was measured on an oscilloscope at 0.712V. This is as expected since 1.20V * 68K / (47K + 68K) = 0.710V, so it is a nice verification that all is well with the set-up. The output peak-peak voltage when the crystal is excited at its resonance frequency is 0.356V. Doing all the algebra to determine the crystal ESR, it comes out at 114K. 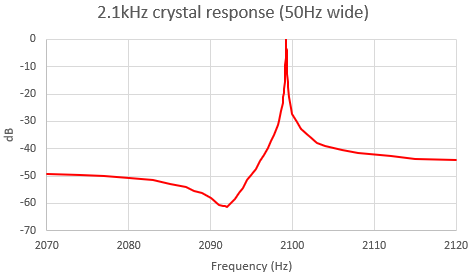 For analysis of the audio level output from the crystal, I used my desktop PC with Xonar U5 24-bit 192kHz soundcard and Argo spectrum analysis software. The audio is biased to mid-rail by the pair of 3.9K resistors as potential divider. The tablet computer is battery powered so its "ground" is floating in any event. 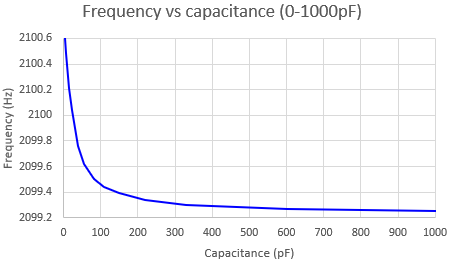 The capacitor C provides slight adjustment of the resonant frequency of the crystal. Not shown: there is a DPDT switch to bypass the crystal, to measure the zero-attenuation level (effectively to calibrate the measurement). I determined that the resonance is at 2099.225Hz and the bandwidth is 0.086Hz yielding a Q of around 25,000. 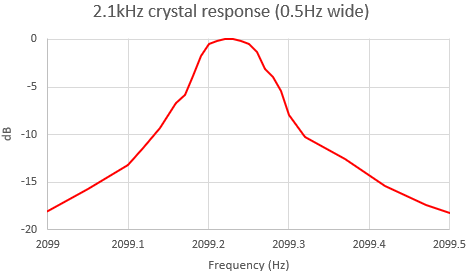 This is the response of the crystal, over a 50Hz frequency span, and 0.5Hz span. It was interesting to note that after the signal generator stopped (the track lasted 30 seconds), the crystal continued ringing detectably for at least a minute. This is shown in the Argo trace below. Time moves from bottom to top (the screen scrolls downwards) in this mode. It was also interesting to see that if the exciting signal was not at resonance, as soon as the signal generator stopped, the crystal returned to oscillate at its resonant frequency until the oscillations died out. The next charts show the resonant frequency as a function of the capacitance C (see circuit above) from the crystal's "centre" connection to ground. The two charts show the frequency shift over the range 0 to 100pF, and 0 to 1000pF. These measurements show that this old crystal is oscillating very nicely. Next the crystal was tried in Ian K3IMW's 2017 circuit (see above). The valve (tube) used is the same CV138 (EF91). Initially nothing happened (as usual) but I thought to try changing the valve, since I have several of that quite common type in stock. I plugged in a new one and it worked immediately! My crystal has three connection so the change compared to Ian's circuit was that in my case I have the small capacitor (Ian used 47pF) from the central terminal to ground. MAGIC! Finally I have an oscillating low frequency crystal in a valve (tube) circuit. The amplitude of the oscillation was huge, I quickly switched it off and reduced the supply voltage by using a large series resistor. From the experiments measuring the crystal, particularly the continuation of the oscillations for long after the signal generator had stopped, I came to understand that this type of extremely low frequency crystal takes AGES to react in an oscillator circuit. You cannot just hold a wire here or there, or hold a component between two connections to see the effect. You cannot do anything that "temporary". Every change must be properly soldered on, then power up and wait a minute or two to see what happens. After switching off the power, you must wait at least 1 minute for the crystal vibrations to die down. Otherwise you haven't started with a fresh static inoperational state, the next time you power up. The capacitance across the crystal (Ian's 4kHz circuit uses 2200pF) requires experiment. My crystal oscillated with all kinds of values of capacitor there, but the time delay required for oscillations to start up is much longer if the capacitance is not optimum. In one case I found that it took a whole 5 minutes for the oscillations to start up! Amazing. 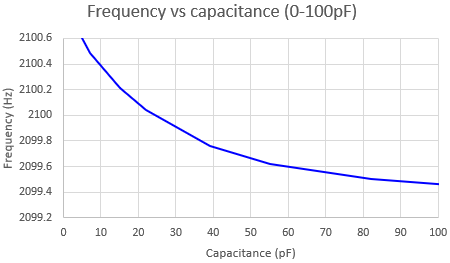 In my case I determined that the optimum capacitance is around 300pF. With this capacitance it takes "only" 25-30 seconds for oscillations to build up to full amplitude. I also experimented with different values of series resistor to the 150V regulated supply. I wanted to keep the oscillation amplitude low because I do not know what level of power these huge crystals are designed to oscillate at; and the last thing I wanted to do is to cause that beautiful crystal to fracture. Which would end the fun permanently. For a large range of supply voltages the peak-peak output amplitude was about 75% of the supply voltage. To see how low I could go, I even connected the supply voltage instead to my 12V regulated power supply. The oscillator STILL worked fine, and the output amplitude was about 3V peak-peak. These photos show the messy construction of the test circuits lying on the workbench. Now that I understood that my original CV138 valve wasn't working, and I understood that in any test I need to wait at least 1 minute before power-up, and again at least 1 minute after power-down, and solder everything properly (not try to hold components or wires in place temporarily as I might normally do); now I wanted to go back to the 2A-D7 oscillator circuit that James VK5ASE sent me. The circuit is after all, very similar to Ian's circuit, and indeed some of the circuits in the various documents (see above). I could get the 2A-D7 circuit to work fine, only if I disconnected the AGC circuit. The AGC circuit limits the amplitude of oscillations and therefore protects the crystal. I tried a lot of things to see if I could make that AGC circuit work. I could verify the rectification action of the diode. But nothing I tried was successful. Probably with a lot more experiment and measurements, I could have made this work. But I was not really sufficiently concerned since I had already seen that this crystal is so active that it will oscillate well even with 12V supply voltage; and so I could easily guarantee no damage to the crystal by using a low supply voltage. 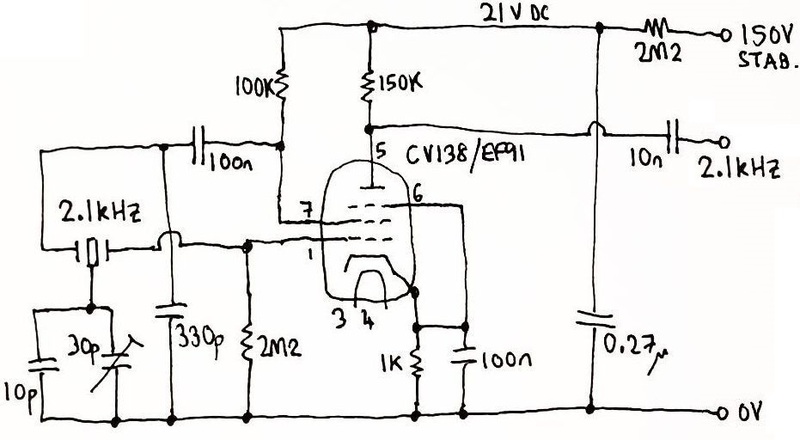 This is my final circuit (below, it uses a 2.2M resistor in series to the circuit, the resulting supply voltage is only 21V and this results in an output peak-peak voltage of about 15V. Ian K3IMW told me he had modified his circuit to be an ECO (Electron-coupled oscillator). Theoretically this provides some isolation between the oscillator section and the output load. It is like using the valve as two-in-one. The 2nd grid is used as an "anode" as far as the oscillator is concerned, so now the valve is oscillating as a triode, though it is really a pentode. Some electrons sneak past that 2nd grid "anode" and make it to the real anode, this current develops a voltage across the anode resistor; the output voltage is taken from the anode but the load does not distract the oscillator much anymore. I have used the ECO before and always liked the concept. It seems to work very well here as well. The following Argo screen shows me adjusting the resonant frequency of the oscillator while using Argo as a very precise (0.01Hz resolution) frequency counter. I was able to adjust the 30pF trimmer capacitor to get the frequency exactly on 2100.00Hz. Note, not shown in this cropped section of the Argo screen, is the top right corner where the "peak at" measurement is shown, which shows both the frequency measurement and amplitude. Note that there was NO connection between the oscillator and the PC, for this measurement! The Xonar U5 USB soundcard used earlier, had been unplugged. The Argo analysis uses the PC's microphone. The PC sits on a shelf in front of the desk. The faint audible 2100Hz vibration from the crystal could be picked up by the microphone and was enough to make the measurement! The photographs below show the small chassis I built for the final circuit. It is made from single-sided FR4 PCB laminate, cut to strips and soldered along the seams. The crystal has four wires (not pins that could fit in a B7G socket). So it is soldered directly into the circuit. To try to cut down the faint audible 2100Hz vibration I put a piece of felt between the crystal and the chassis. To hold the crystal securely I built a kind of holder for it, from a piece of the PCB material, which is bolted to a large steel hex stand-off found in the junk-box.